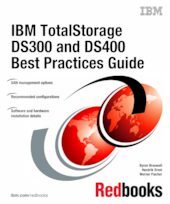 This IBM Redbooks publication represents a compilation of best practices for configuring the IBM TotalStorage DS300 (iSCSI) and DS400 (Fibre). These workgroup storage subsystems for IBM eServer xSeries and BladeCenter servers are designed to provide an exceptional solution for workgroup storage applications such as file, print and Web serving, as well as, remote boot storage for diskless servers. This book is intended for IBM technical professionals, Business Partners, and customers responsible for the planning, deployment, and maintenance of IBM TotalStorage DS300/DS400 products.